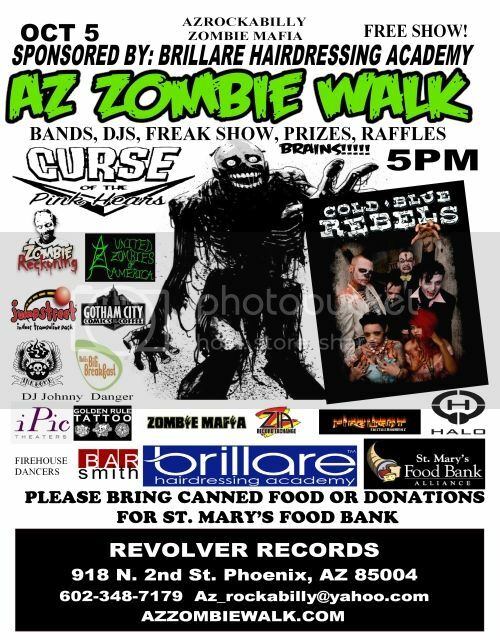 3rd Annual Az Zombie Walk Oct. 5 2012 - Zombiewalk.com - Your source for all Zombie Walk and Zombie Flash Mob planning! Last edited by azrockabilly; 09-19-2012 at 01:49 AM. i'm doing a zombie walk in my hometown of Odessa Texas in October as well. It seems like you have your stuff together so i was hoping that maybe you could help me with mine. i understand you might be swamped with your own walk but i desperately need help. We don't have anything set up nearly as cool as yours but considering this is the first year we're trying to keep it simple. there's more details but i feel it would be better if we communicated directly. My Email is mikeregalado1982@yahoo.com. I would GREATLY APPRECIATE it if you could help. Thank you for your time.